Welcome to Critic's Notebook, a quick and off-the-cuff car review consisting of impressions, jottings, and marginalia regarding whatever The Drive writers happen to be driving. 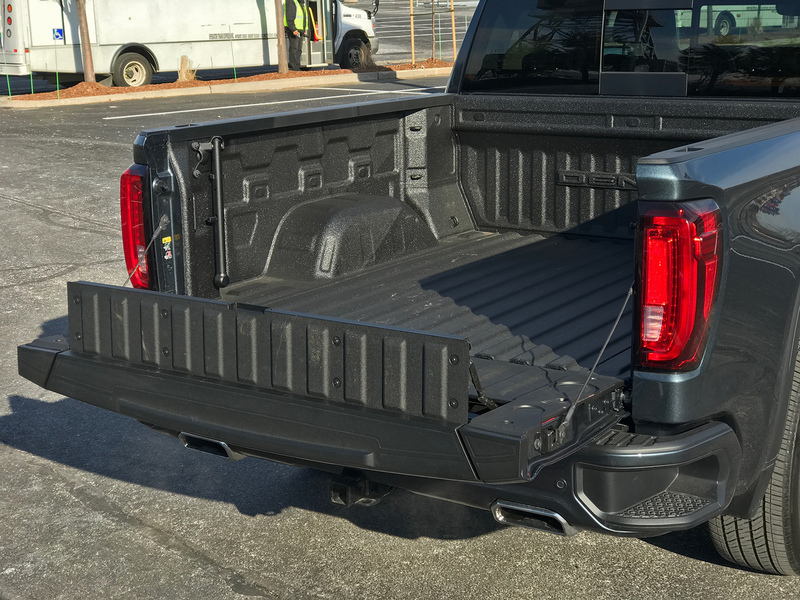 Today's edition: the 2019 GMC Sierra Denali 1500 4WD Crew Cab. Quick Take: The fanciest GMC Sierra you can buy offers a buffet of interesting tech and features, but is it enough to justify the price? If the GMC brand can seem as though it doesn't need to exist—Chrysler and Ford get by selling a bajillion trucks under one brand, why can't GM?—the Denali sub-brand makes even less sense. Between the plethora of high-end SUVs and pickup trucks spread across the carmaker's other brands, it seems utterly redundant; for just about every GMC Denali, there's a Chevrolet High Country, a Buick, or a Cadillac that's all but identical aside from a front end and slight tweaks in tuning. It ain't ugly. 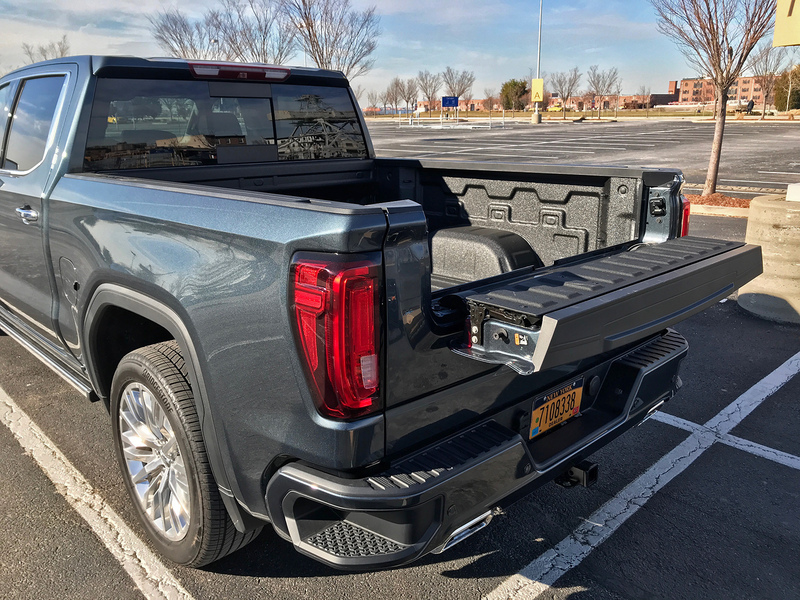 While I'm not among the legions out there hating on the 2019 Chevy Silverado for its front end, there's no disputing the GMC Sierra is the better-looking of GM's full-size pickup twins. The Denali grille looks less like the business end of a Norelco electric razor than before, and the overall face somewhat resembles an improved version of the awkward-yet-handsome Nissan Titan. The chrome spanglies that come with the Denali trim would probably be a little much on a truck clad in a darker color, but they fit nicely with the bluish-gray Dark Sky Metallic paint of my tester. 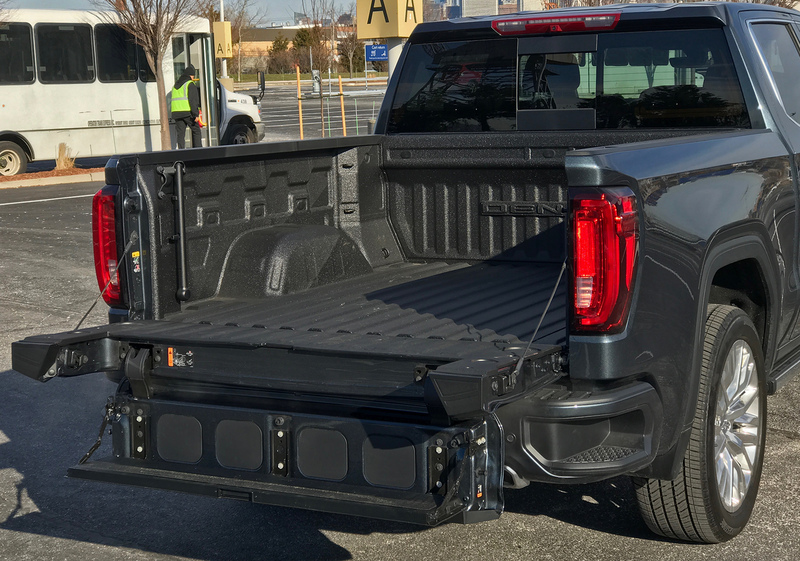 GMC's trick tailgate, which also receives the MultiPro label, is a "pro" in the sense that it adds options to the ways you interact with the truck. Choice is always good, right? And, as always, it bears repeating: It's a four-wheel-drive crew cab pickup truck, which makes it of the most versatile, utilitarian conveyances ever built and sold to the public. It can seat five adults in comfort and safety, play music, charge your electronics, carry hundreds of pounds of cargo, tow thousands of pounds more, scramble through snow, mud, and dirt, and cruise along at 100-plus miles per hour—and often do many of these at once—all without breaking a sweat. For a truck that's also supposed to be a luxury product, the Sierra Denali doesn't seem particularly good at delivering the driving characteristics of either. 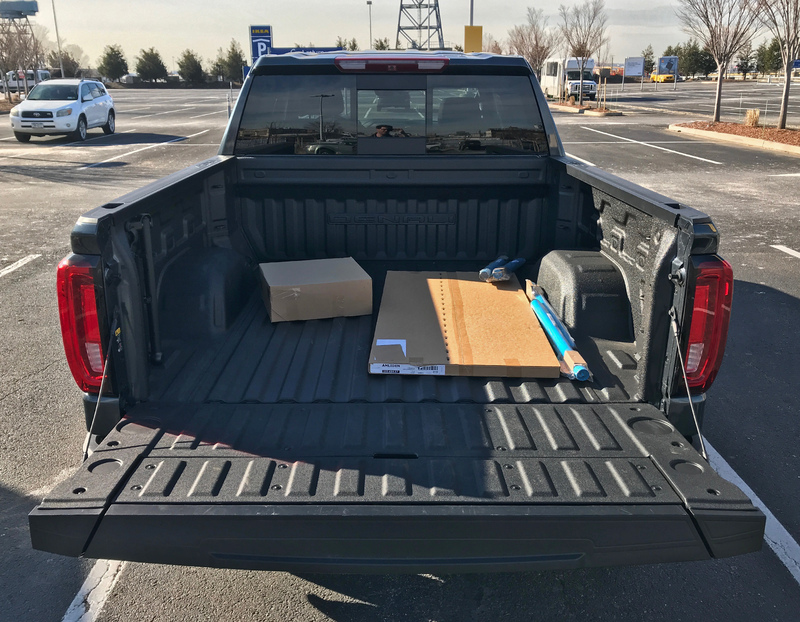 Even with a suspension designed to handle a GVWR of 7,100 pounds, with adaptive dampers and three tons of mass, this truck should ride more smoothly than it does. (Part of the blame must go to those chrome-plated 22-inch wheels—city slicker specials ill-suited to the actual big city's cobblestones and broken pavement.) 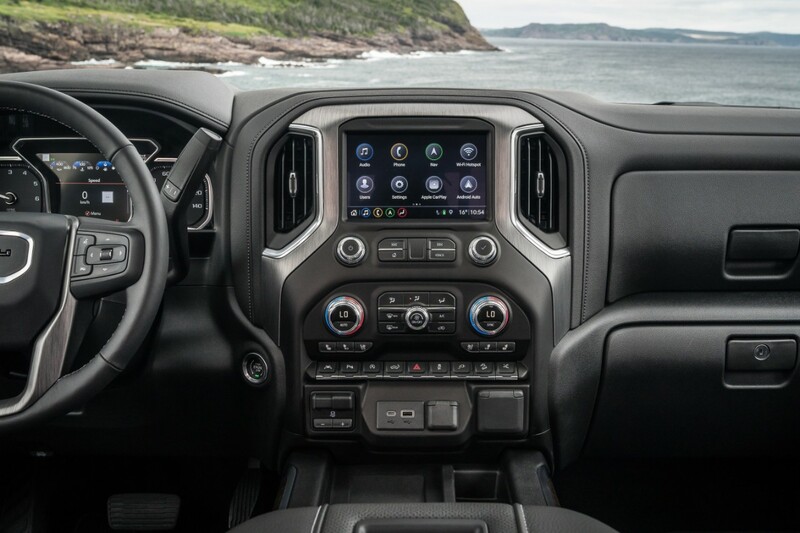 And the throttle is remarkably sensitive, sending the GMC lurching forward with a brush of the foot, which seems like exactly what you don't want when a good percentage of your buyers are likely to wear boots on a regular basis. That MultiPro tailgate, for all its trick features, seems like something of a solution in search of a problem. Sure, the fold-out step is handy, but there's already a toe hold a couple feet away built into the corner of the bumper—and that one comes with the added bonus of letting you grab the bed wall for support. Folding down the top piece might come in handy for that rare occasion where you need to fetch something from the back of the bed without everything else spilling out—but does that really happen so frequently that it's worth adding the complexity of hinges and joints, rather than just stepping on a bucket and leaning in? And what's the point of the wanna-be Gurney flap that can flip up when the tailgate is down? 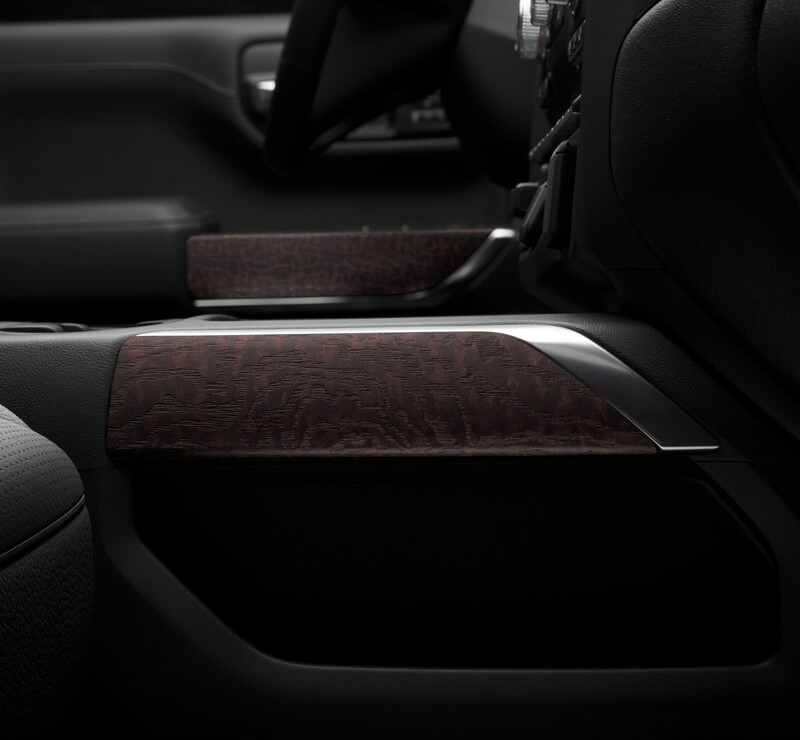 But all those grievances, ultimately, are minor compared to the issues with the Denali's interior. Indeed, it's an even greater letdown than the Silverado's instantly-outdated guts—because it looks all but the same, just at a higher price. The leather feels worthy of a $35,000 car, not one pushing twice as much. There's hard black plastic and textured rubber-like substances everywhere, even where your fingers are likely to fall—a cardinal sin in a luxury car. Even the nicer trim seems intentionally mismatched; there's some pleasant open-pore ash wood on the doors, but the dashboard, wheel, and center console are stuck with cheap-looking aluminum. (I honestly thought it was plastic until I looked it up.) This much plastic is already kind of insulting in a near-luxury vehicle; don't compound the issue by forcing me to stare at clashing materials on top of that. It's not hard for pickup trucks to rack up lofty pricetags these days, even without luxury badges. (Benjamin Preston's recently-tested Sierra AT4 had a price tag almost equal to my rig's, in spite of a lack of a big chrome grille.) Even so, in an era when the average price of a new pickup truck runs around $48,000 (and, simultaneously, millions of Americans are defaulting on auto loans), it's worth examining vehicles like this with an extra-critical eye to see if they're worth the money—both in a vacuum, and compared to other cars and trucks out there. 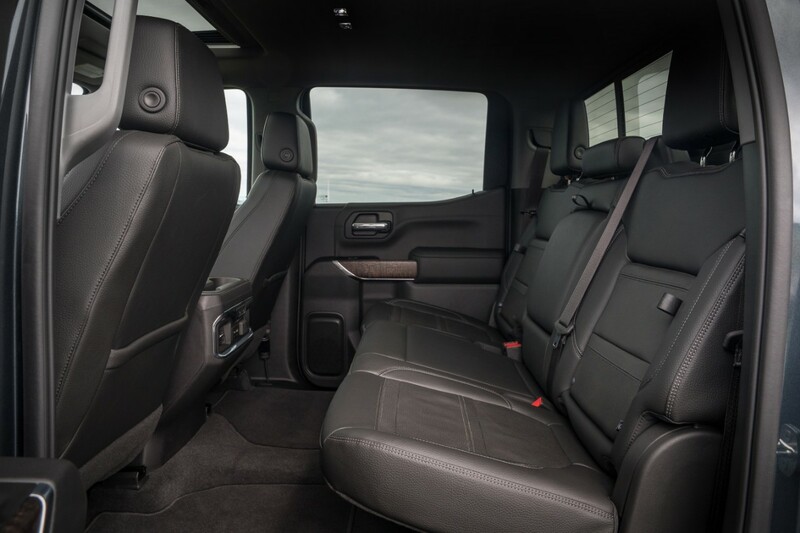 If you want a luxurious truck, look at the Ram 1500 Limited. 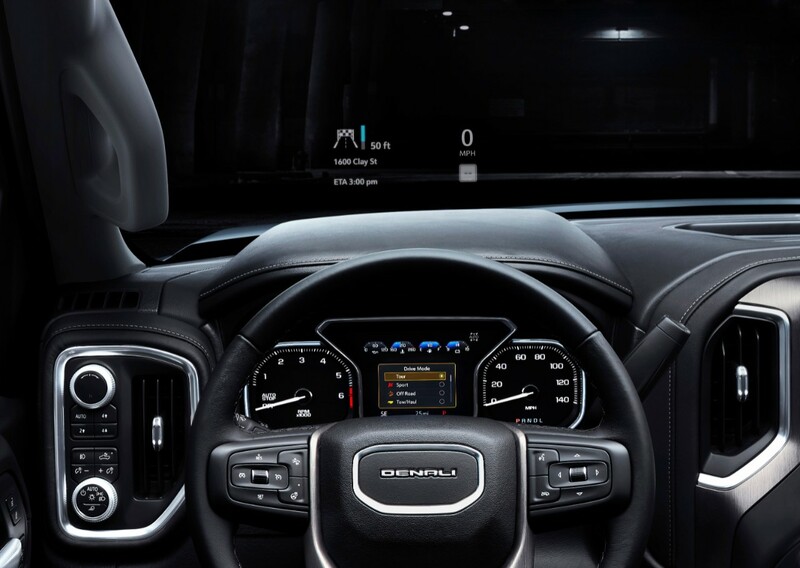 But with trucks like it and the Ford F-150 Limited floating around, the Denali needs to seriously up its interior in order to battle it out in the priciest pickup realms. GMC certainly deserves accolades for being ahead of everyone else when it came to the Denali lineup. In a segment where brand loyalty is pretty much valued above all else and fancy four-door pickups are booming in popularity, being the first to a niche can translate to success—and GMC has been cranking out Denali pickups for 17 years. Perhaps it's not surprising, then, that even by the standards of the truck-and-SUV-happy U.S. auto market, the brand formerly and broadly known as the General Motors Company has been seeing sales of its high-end rigs rise and rise: For a lot of people, when they think of bougie trucks, they think Denali. But products like the all-new 2019 Sierra Denali also suggest the brand's years of dominance in the space may have made it a bit complacent. 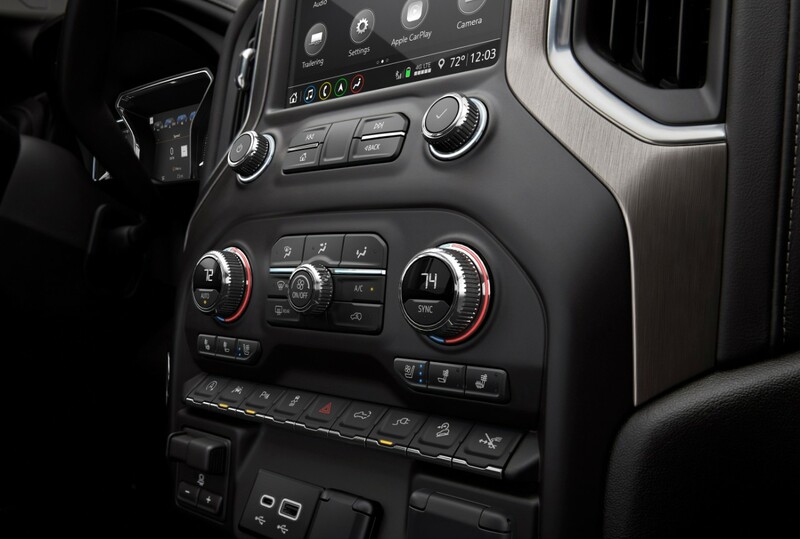 Chevrolet made much of its strategy to forgo conquests with the new Silverado in favor of keeping the base happy upon launching that truck, and it seems as though GMC may be trying to do the same. Trouble is, well, there's trouble on all sides and down the road alike, now that the world has woken up to the profits to be found in fancy trucks. The aforementioned Limited-trim Rams and F-Series show how far the needle has moved amongst the Big Three on that count. Lifestyle buyers will soon be temped by the likes of Rivian and Tesla. Hell, those looking for big-buck bragging rights could also be tempted by the heavy-duty Sierra Denali, a truck that offers similar niceties but far more capability for not much more money. If GMC, like Chevy, just wants to keep the current owners happy, it's likely to see sales hold steady for a little while. But axioms exist because of the truth within—and there's a reason "complacency breeds success" isn't one of them.